A pair of thin gloves ($2 at Wal-Mart). A chunk of foam (Can get at Jo-Ann Fabrics). 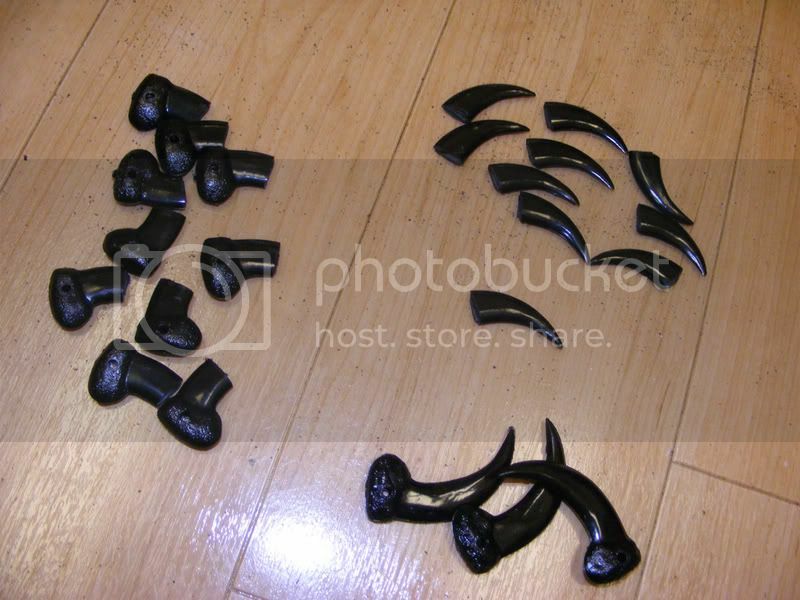 Claws (if desired - can be made of sculpy, fimo, etc. or bought - boy scout beads are awesome). Hot glue & hot glue gun. Scissors, exact knife, et cetera for carving and cutting. IMPORTANT NOTE: If you intend to have claws, leave at least a half-inch or more of space above the tip of each finger on your hand. Determine this by constantly trying on the finger padding as your carve them. 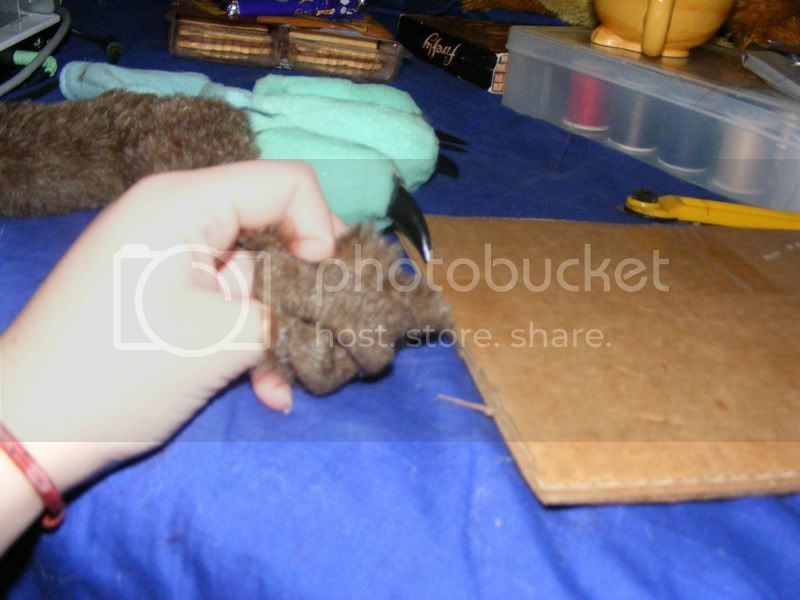 Make the fingers thinner than you want the hands to ultimately look, since fur does bulk things up a lot. I did so by hand, which is hella hard on the wrists so... take plenty of breaks and roll/stretch them often I suppose. If anyone has a suggestion on how better to cut the claws, I'd love to hear it. 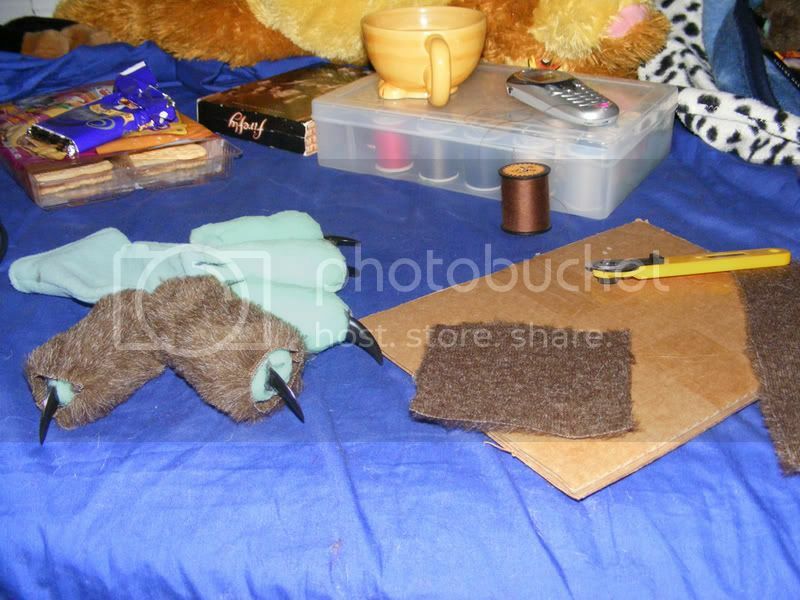 Again, some work can be avoided if you have a sewing machine. If you do, sew the arm portion (the wrist down in the drawing) by machine. The finger portion must be done by hand no matter what. Here, I had no machine, and so opted to just sew them on one half at a time. As you sew the backing to the fingers, do NOT sew in-between the fingers. This causes wrinkles and bagginess and unpleasantness. 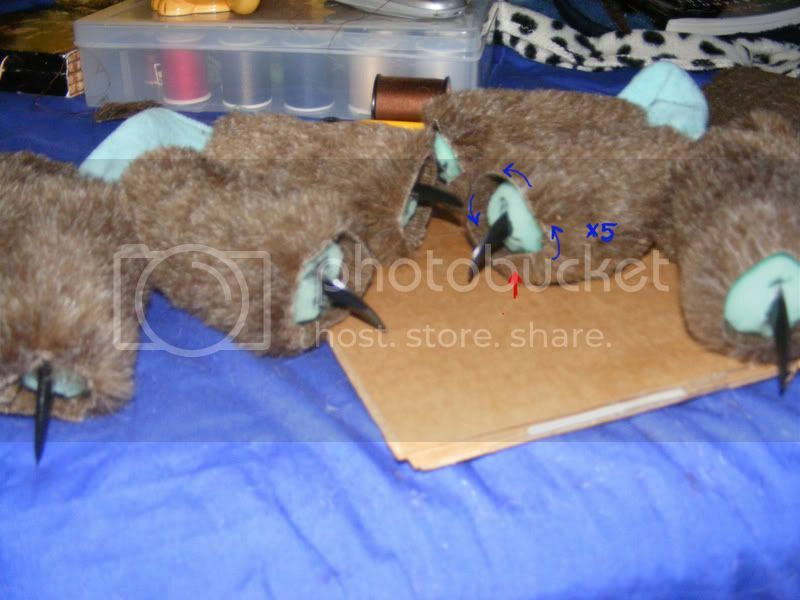 Just sew to the bases of the fingers. In my experience, the bulk of the fingers holds them so close together that you can never see in-between them at the base, no matter how you pose them. Also be sure to leave plentiful room in between your index finger and you thumb - extend your thumb away from your hand as far as you can go when drawing the pattern and trying on the hand in-between sewing to make sure you retain a full range of motion with it. 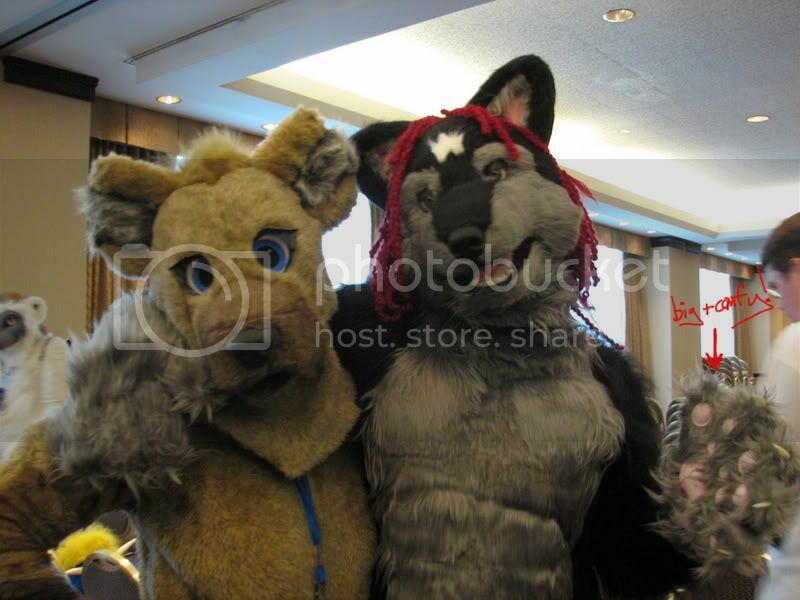 Those are the hand-paws to my Blood Raven suit. 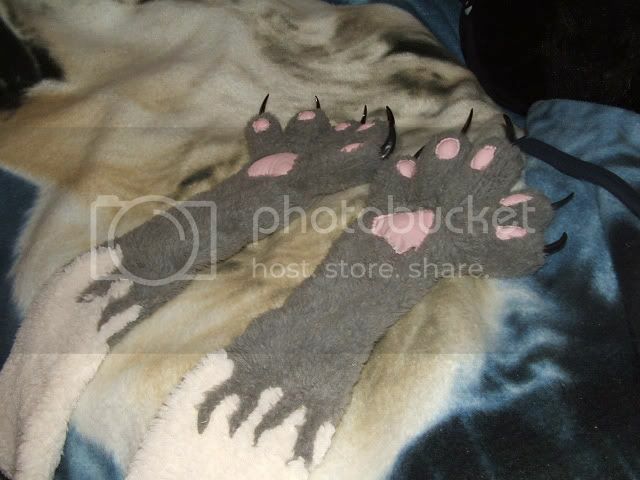 There are numerous ways to go about making paw pads; how I do it is by simply cutting the shapes out of fabric (fleece or felt does fine), leaving a 1/4 border of excess. 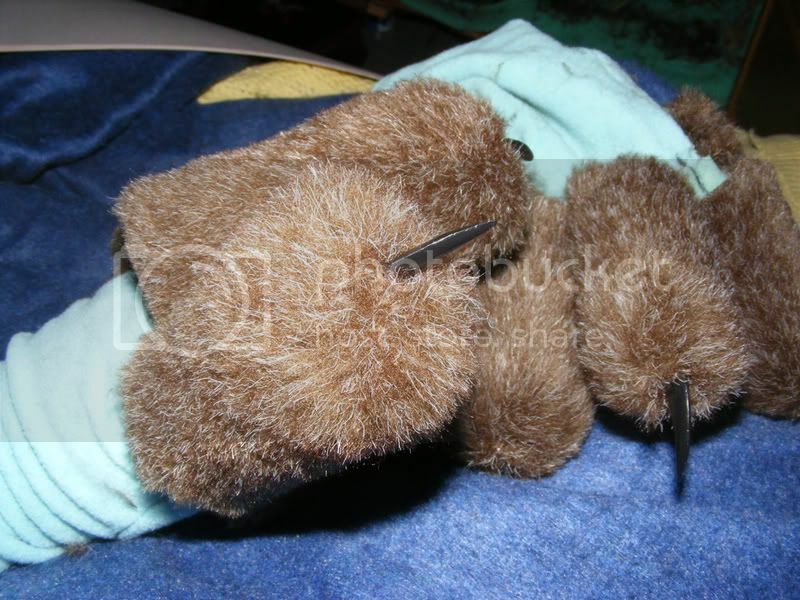 Sew the excess under to give it a clean look and prevent fraying, and then sew the pad pads onto the hands, leaving a small gap, through which you stuff them before sewing up the gap, giving the paw pads a squishy, 3-dimensional look. Why bother to pad hand-paws when you can just trace your hand and be done with it? It depends on the style of your suit, really. If you had an extreme skin-tight, latex or cast head, padded paws might be too large. 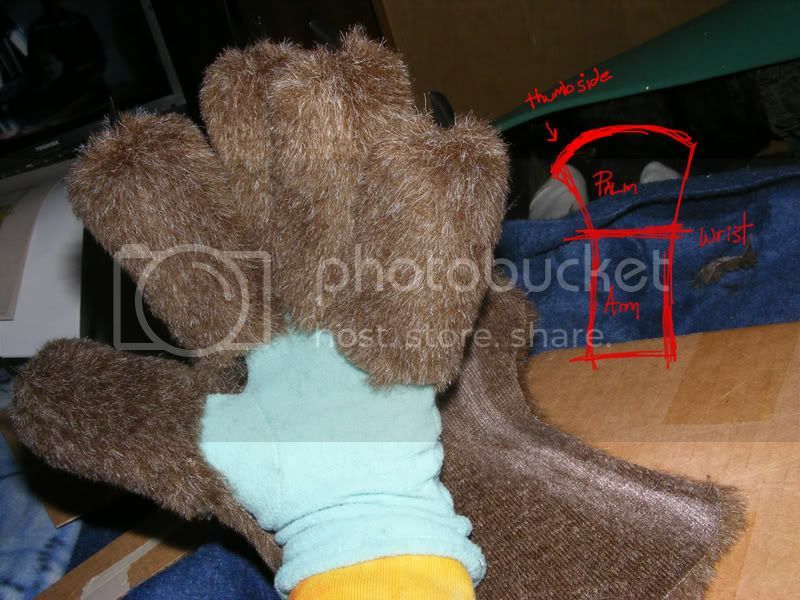 But for foam or mesh heads, padded paws are more proportional to your head. For comparison, hold up your hand to your face - does it cover most of your face? Usually the answer is yes. Hence my fondness for padding. 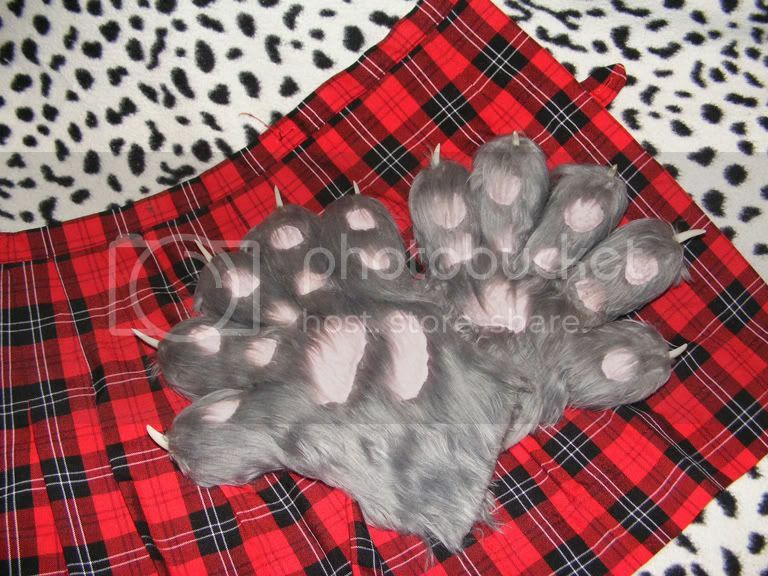 :) Additionally, they're really comfortable and look more paw-like than hand-like, which is fun. The fingers are flexible/bendable despite the hot glue, although you *do* loose some dexterity, which is also something to keep in mind, if your performance in-suit requires nimble hands. I have no idea how you came up with that fur cinching technique around the claws, but it's totally ingenious. Can't wait to see your new suit. Yay, you're welcome, hope it's helpful! 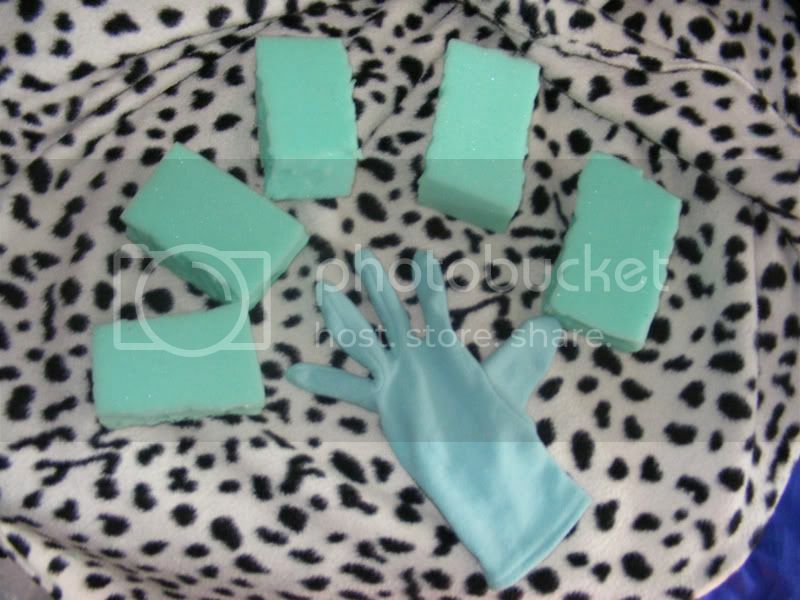 Question:So the blocks of foam that the paw digits are made from are just carved down to cylinders? Also how do you hollow them out? 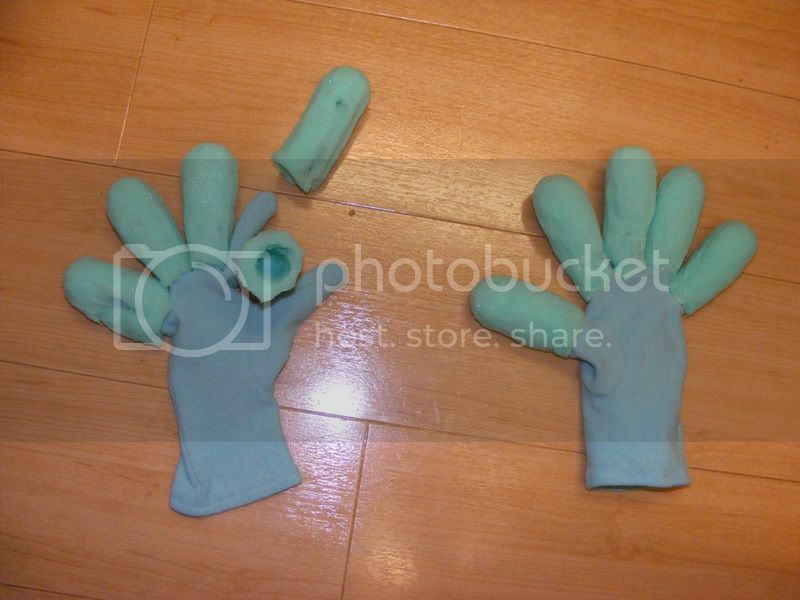 Im curious, i might use this method instead of the glove pattern one. Yep! You just carve them down with a pair of scissors. Hollowing them out is just a matter of poking a hole in the base with the scissors, and then ripping away at the interior - with the scissors or by literally just picking/ripping at it with your hands, polyfoam isn't terribly tough to pull apart - until you've got it to fit your finger nice and snug. is this 1/2 inch or 1 inchthick foam? cutting claws is simple! make sure the plastic is nice and cold. freezer or fridge. score a line on each side where you want them cut. 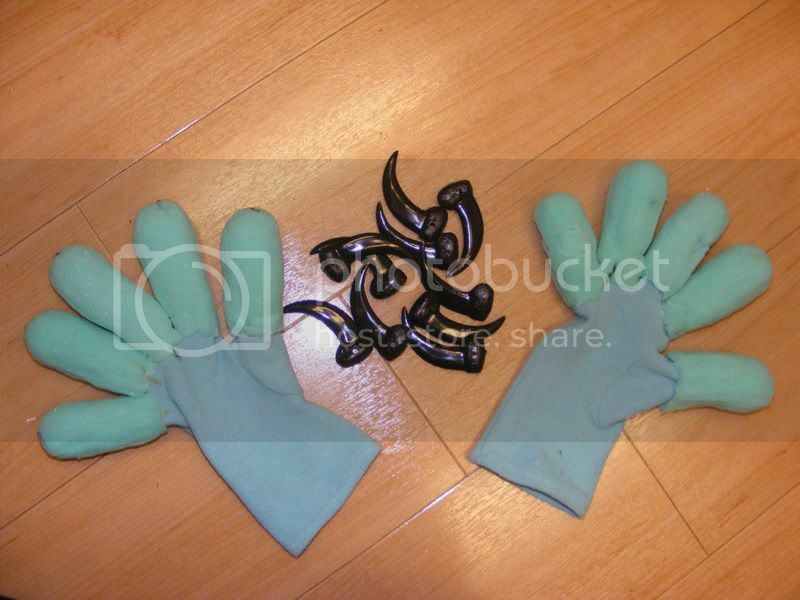 take a pair of plyers and hold the base of the claw and SNAP them off. it will leave a clean cut right along the score mark . Freeze them, eh? Never would of thought of that - thanks! I'll give it a try next time. Thanks, I tried that and it worked. Its wasn't really clean cut, but all I had to do was shave it down a bit with my exato blade. Thanks. 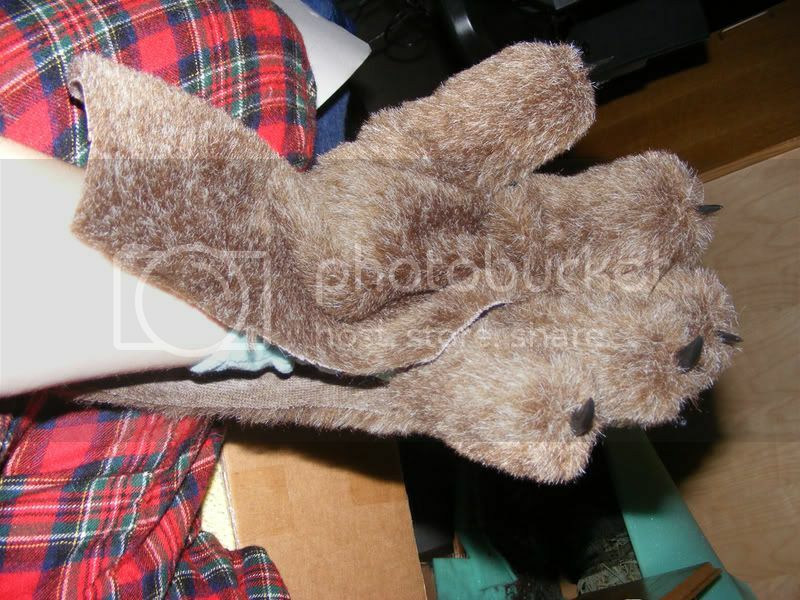 oh.. and on those grey paws.. why is the fur going the wrong way? 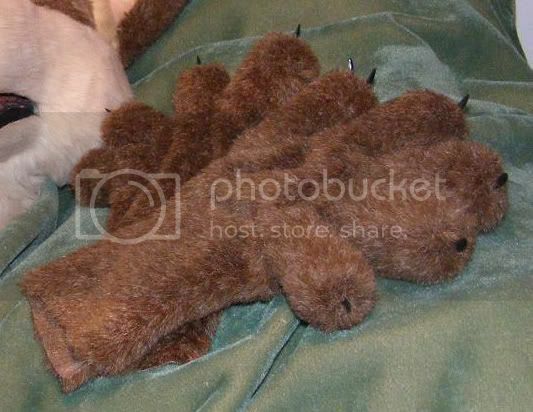 so I suppose you could make these look more realistic by just carving in a tad more detail into the foam cylindars (ie, more knuckles and joints) I am so going to use this for my werewolf suit, thats bunches! oh wow. this is greatt! 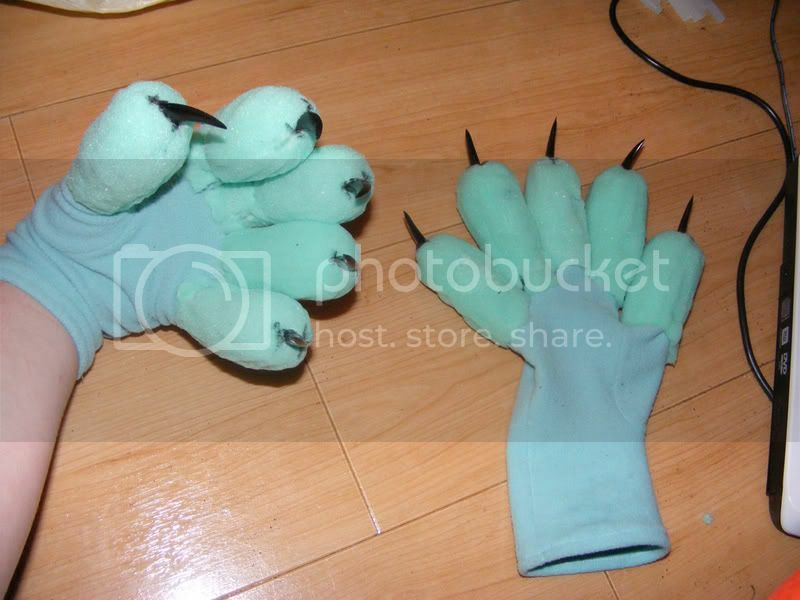 im making tiger paws and arm, and dont no how to to the colours. wether i should airbrush them on, use white finger tips, white palm, and and orange back of hand? i want them as realistic as possible i guess. This is amazing! Thank you for sharing. I'm not really planning on doing a fursuit as it's soo time consuming and requires a sewing machine. However I was thinking how I was going to do a jolteon gijinka and I'd like to do paws for the character. So thank you for sharing this surely will come in handy! About how much fur do you need just for the basic gloves (not the full arm sleeves) ?